Indoor pollution is a horrible reality. Even the Environmental Protection Agency has dubbed indoor pollution as the fourth biggest environmental threat. It is also something that can be easily taken care of thanks to regular air duct cleaning. When you have the air conditioner or heating system on, air is traveling through the air ducts into your home. This air can be full of dust and contaminants. Over time, this can build up making the air in your home sometimes unhealthy to breathe. There are many benefits to having your air ducts cleaned. First of all, it improves the air quality in your home. It reduces the contaminants previously mentioned coming into your home. These contaminants include bacteria, dust mites, old, chemicals, and allergens. Indoor air can be up to 70 times more polluted than the air outside. 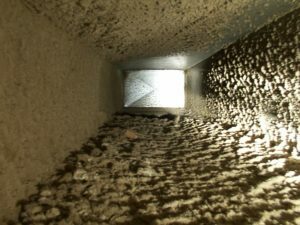 For this reason, air duct cleaning is essential, especially if anyone in your home suffers from allergies. Tired of dusting one day only to find a need to do it again a few days later? Cleaning your air ducts will reduce the amount of dust coming into your home and settling. Air duct cleaning will cut back the amount of time you need to dust! So, it isn’t just you and your family who will benefit from the cleaner air but your furniture and belongings too. Have a lingering odor that doesn’t seem to want to go away? It could be because of your air ducts. Stagnant smells from pets, tobacco, fumes from paint and cleaning solutions, and smells from cooking can get into the air vents and continuously circulate in the air. You will also get a musty smell from an air duct that hasn’t been cleaned in a while. Regular air duct and vent cleaning will also save you money. It only takes the tiniest amount of dirt and dust build-up on heating coils to decrease its efficiency by over 20%. A build-up will also decrease air flow. Therefore, it takes more energy to run at your chosen temperature. More energy used means higher electric bills. Keep your costs at a minimum with clean air ducts. Finally, air duct cleaning can help you avoid the devastation of having your air conditioning unit fail in the middle of summer or heating stop in the dead of winter. Nine out of ten units stop working because of a build-up of dirt and dust. There is a fan in the handler that is meant to keep the heat exchanger cool. The build-up will reduce this flow of cool air by up to 50%. This will cause it to overheat and crack. Your unit will age quicker with too much dirt and debris, so it is important to keep it clean so you don’t have the stress of getting a new a/c unit before you’re due one.